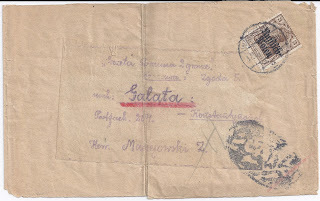 It is an improvised newspaper wrapper (Banderole) addressed from a Warsaw Polish-language Gazeta to a subscriber in Galata who has a Polish name. 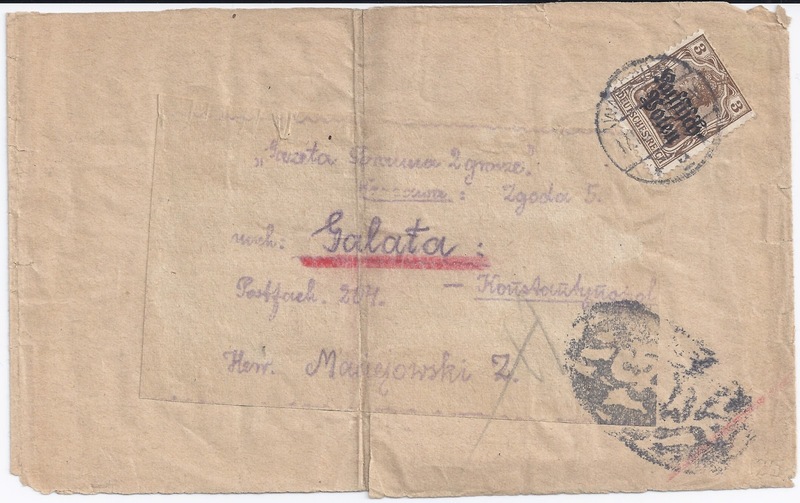 The address label has been made using one of those machines which preceded office duplicators (I forget what they were called) though the word "Galata" has been overwritten in violet pencil and, separately, underlined in red crayon - something German postal officials did to clarify addresses. The franking is provided by a 3 Pf Germania overprinted "Russisch Polen" cancelled with a German language WARSCHAU dated (I think) 1916. That the item arrived is shown by the Turkish Censor cachet at the bottom right. The grey pencil mark to the left of it could be a Censor's initial. Anyway, I show it here just because it strikes me as unusual and unexpected. Auction Houses: They Are Not All The Same!